Social work is our priority. There are many poor children in Narva region. Their parents are unemployed, drink much alcohol or take drugs and so on. That's why children have negative life experience; in practice they do not see happy family life. Next pictures depict living conditions of those people who live in communal houses, where Mercy Center has Children rooms. Not long ago one man who has no electricity in his room tried to make fire in a hall to cook some food, now all walls in the hall are beat-up and burnt. 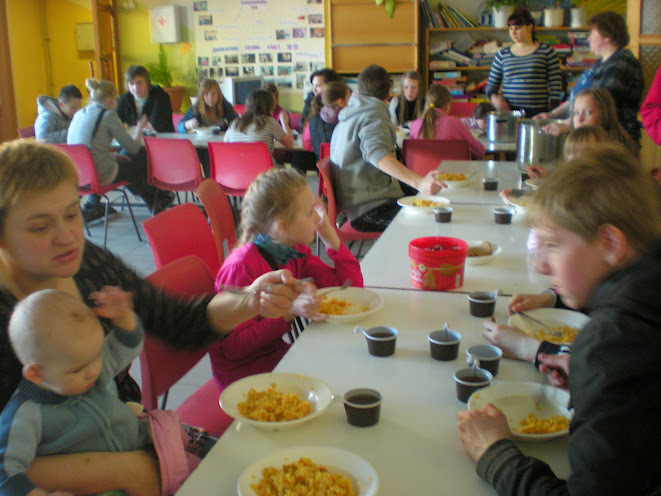 Mercy Center's aim is to provide the neediest things to people who are socially unprotected group of society, especially poor children and youth of Narva town, living in crisis families and communal houses. We make distribution of clothes. Thank you for the holidays, that you gave to the children, dear friends!!! Greetings from all people to whom you help!!! Thank you so much for support!! !